King Arthur sells an impressive gluten free pizza crust mix. I’d confidently serve this pizza to my gluten eating friends and the dough seems versatile enough to try with a multitude of toppings. The mix produces two thick, but lightweight crusts that could be compared to focaccia bread. I’ve only discovered one downside to King Arthur’s product, which for me is pretty minor. The amount of time that goes into the prep is lengthy, probably comparable to making your own from scratch, but the tradeoff is that this mix is guaranteed to be good. 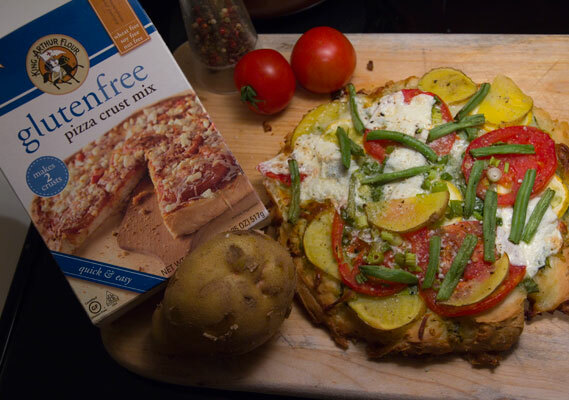 Many gluten free pizza crust mixes turn out with a texture that leaves much to be desired. If you are opting for a mix, King Arthur’s is highly recommended.